"I'll make you Queen of the Blue Sea! Cast off there, dogs! We'll scorch King Yildiz's pantaloons yet, by Crom!" 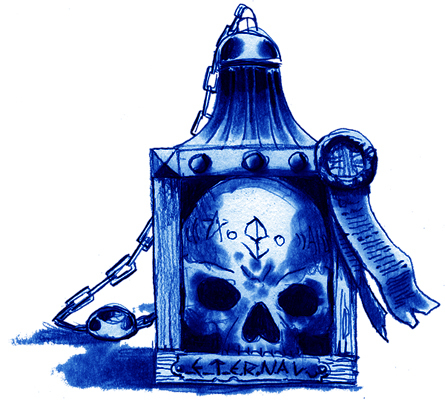 Just a quick post to let subscribers know that the latest orders are eeking out of Cimmerian central at the rate of four or five per business day, so if you haven’t received yours yet do not despair, it is coming. Now that the Centennial year is nearing its spiritual completion (the V3 Index is the last obligation to meet on that score) I’m going to start emailing confirmation numbers again for every order, so keep an eye in your in-box for that, which will let you know when its on its way. The perils of running a one-man shop are becoming more apparent as time goes on. Only so many boxes can fit into a car during any one trip, only so many Cimmerian-related hours can be squeezed out of any one week, and only so many new subscribers can be added to the rolls before the task of invoicing/packing/mailing grows to near-insurmountable proportions. This, by the way, is why I don’t take subscriber money up front. Delays aren’t fun, but at least you don’t have $$$ wrapped up in them. The good news is that those who have seen the slipcases have gone ga-ga over them. Last night the venerable Donald Sidney-Fryer, a man who has seen a lot in his day, declared that they were “among the finest examples of collector packaging I’ve ever seen.” I don’t know about that, but it was sure something to pack one of them full of Deluxe V3 issues and put it up on the shelf next to the first two. Seeing it there taking up so much space brought home how extensive the 2006 Cimmerian achievement had been. That’s a whole lot of writin’ sitting in that slipcase. The August issue is shaping up nicely, with a Cross Plains trip report unlike any others I’ve printed, written as it is from the vantage point of a new attendee to the event. I’m going to try to get the Awards issue finished in time to mail along with the August issue, but no promises on that score. A few new Cimmerian library booklets are nearing completion as well, some Howard-related, and some focusing on aspects of legendary genre (and REH) publisher Arkham House. Once those get up to 10 issues or so, I’ll look into making a slipcase for them, too. On the fantasy scholarship front, check the Black Gate website this Sunday for an article by Ryan Harvey about Poul Anderson’s classic Icelandic saga homage The Broken Sword. 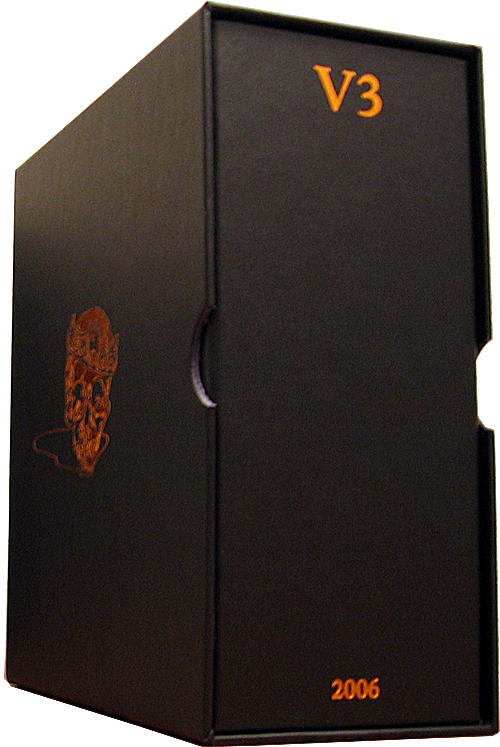 At long last, the deluxe slipcases for the Centennial year are in-house. I received word on these being finished last week, so I held off on mailing V4n3 until I got them, so that I can send everything at the same time and save most of you five bucks or so on shipping. I now turn to the process of packing and mailing these out to you, a process that will take a few days and a lot of packing popcorn. Most of these are already spoken for, but if you want one of the last ones drop me a line and let me know. 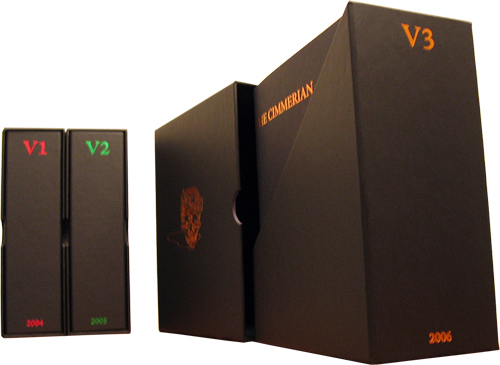 Check the slipcases page for information on their construction and for pricing. UPDATE: There’s only eight left. Get ’em while you can. Marvel Comics initiates are well aware that the madder the Hulk gets, the stronger the Hulk gets. Similarly, the older Christopher Lee gets, the cooler Christopher Lee gets. Long before Saruman and Count Dooku (alas, a role as a nefarious guest star on the cover of Band on the Run had more substance to it than Lee was granted in the Lucasverse), n’er-do-wells were never done so well as Rochefort in Richard Lester’s The Three Musketeers and The Four Musketeers (I sob openly when Michael York runs him through), Francisco Scaramanga in The Man With the Golden Gun (Lee, a cousin of sorts to Ian Fleming, was on the author’s wish list of perfect Dr. Nos) and Lord Summerisle in the original The Wicker Man (actually the only Wicker Man that need concern us). Lee was Flay in the BBC’s Gormenghast miniseries, worked with members of Steeleye Span on a musical adaptation of The King of Elfland’s Daughter, and once confessed to John Carpenter that his career-worst misstep was turning down the role of Dr. Sam Loomis in Halloween. 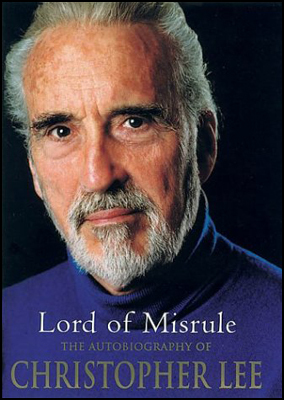 The expanded and splendidly retitled 2004 version of his autobiography, Lord of Misrule, is required reading. For the most part, it’s been great fun watching the Wikipedia “community” have at the long biographical entry I wrote for Robert E. Howard’s Wikipedia page last year. I haven’t agreed with many of the tweaks made, but the mere fact they are being attempted is a sign of how many people out there are Howard fans to some degree. There have been literally hundreds of edits to the page, every one of which is logged here. It’s fun to browse through this log, select two different versions using the radio buttons at the left, and hit “Compare Selected Versions” to see exactly what was done in each edit. Since Robert E. Howard died 70 years ago, all his works and characters (including Conan) have now fallen into the public domain and are free for all to use as they wish. No institution may lawfully claim any right to them what-so-ever. This despite the education he has received from other visitors on the ins-and-outs of current copyright law. However, all in all my initial posting of text has held up rather well, a bit frayed at the edges but with the core information sitting out there like a rock with the waves of editors crashing against it day after day. I was pleased to note at the WFC that panel moderator Steven Gould had educated himself about Howard in preparation for his panel with Glenn Lord and myself by printing out a copy of the entry. Getting Howard’s entry up to scratch was worth the time invested for sure. But check out this page, which shows in red type a series of changes instituted by an anonymous, unregistered editor. It makes you wonder who would go so far out of their way to modify REH’s page in this way, and why. Clicking on the IP Address of the vandal in question shows that he also has selectively edited some entries dealing with Islam, tweaking words like “militant” into “terrorist” and so forth. To me his actions seem contradictory: I assume his calling REH a Jew is meant to color our perception of REH in a negative way, whereas his other Wikipedia edits seem to be anti-Muslim. Or perhaps he feels that his bogus revelation of REH’s heritage is a badge of honor. Who knows, and ultimately who cares. Anyone who would harp so incessantly on someone’s ancestry clearly has ugly personal issues that transcend any attempt to rationalize them. Like most other instances of vandalism to Wikipedia pages, this guy’s was quickly deleted by an observant reader. 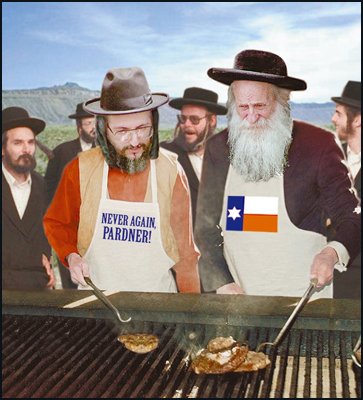 What’s doubly strange is that this is the second time I’ve seen Howard painted as Jewish this month — readers of the soon-to-ship V4n3 can check out Paul Shovlin’s Contributor’s Blurb to get the lowdown on the other incident I am speaking of, one that confirmed for me that “peer-reviewed” publications are often not what they are cracked up to be. Steve, I’d love to read your opinion of this odd new Jewish Question in Howard studies. Reacting to Volume One of The Collected Letters of Robert E. Howard, earlier this week Leo wrote “This is the kind of thing that tends to shake loose all kinds of scholarship that would otherwise never have been written.” Scholarly scholarship is beyond my reach even when I’m at my best, and I’m never ever at my best on a Friday afternoon, but I’d like to cheat by riffing on a passage from Howard’s August 9, 1932 letter to Lovecraft that will appear in the middle Collected Letters volume. Most of us are familiar with Fritz Leiber’s observation that the Texan “knew the words and phrases of power and sought to use them as soon and as often as possible.” So, too, did he know the symbols and images of power — an excardiated heart, for example. The organ in question, even when divine or alien, might be a thuddingly, or throbbingly, obvious symbol, but we can all name authors who would do well to be less wary of the obvious and more wary of the obscure. Head on over to Rehupa.com to read Official Editor Bill “Indy” Cavalier’s thoughts on this year’s Howard Days. Lots of Howardian merrymaking and mayhem told in our Benevolent Dictator’s inimitable style. At one point he mentions his donation to the Silent Auction, a “carved REH plaque.” Indy does all sorts of artistry, wood carving, and sign making at his day job, so a project like this is right up his alley. Back in 2005 he donated a similar plaque to the Silent Auction with (as I recall) only red and black colors in the mix. 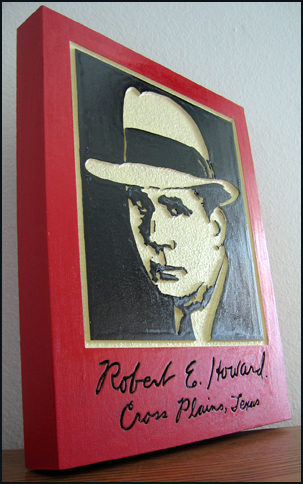 Carved from wood just like this one, hand-painted, suitable for hanging on your wall, with an accurate facsimile of Howard’s original signature at the bottom. At the time I thought the plaque way cool and unique, but ended up giving it up to another drooling fan. When I saw this new and improved one on the auction table this year, I had to have it. I ended up bidding $100 to take it home, and I’m sure you can see from the photo above why I’m glad I did. I’m not much of a collector — my entire Howard collection takes up about three feet of bookshelf — but having this lovingly crafted item reminding me about one of my best friends in the field is worth a thousand Jenkins Gent from Bear Creeks. At least until I break it over someone’s head during the next rowdy Howard get-together…. As usual, I’m on the lookout for reminiscences, anecdotes, and photographs from all of you who attended Howard Days this year. With more things going on than any one person can cover, it really helps to get some different perspectives. Plus there are always choice one-liners and pithy observations that are remembered by some and forgotten by others. Within the next few days, at least. Until then, check out some excerpts here. For those of you who recoiled at the negativity inherent in the last issue, this one should serve as a welcome salve. Lots of food for thought. 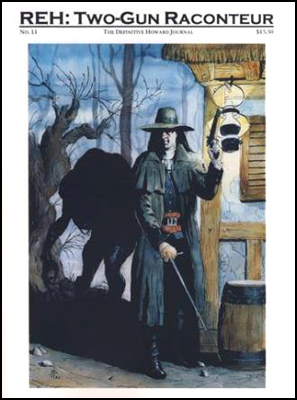 I daresay the Shovlin piece is arguably the single best thing on Solomon Kane ever written. At this year’s Howard Days I was struck by the quality of some of the publications debuting there, and thought I’d pass on my thoughts to the Howardian public. 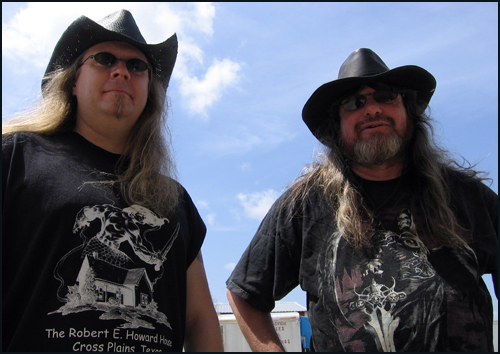 Over the last year Damon Sasser, a good friend of The Cimmerian, has actively striven to improve his flagship publication REH: Two-Gun Raconteur in a variety of ways. From soliciting more thoughtful articles to starting a blog for Howard-related news, he’s taking the best that the 1970s fanzine heyday had to offer — lots of art, rare Howard originals — and fusing it with the more scholarly, serious tone of the modern era. I note that Damon has re-christened his magazine from “The Definitive Howard Fanzine” to “The Definitive Howard Journal.” A small change, but it hints at the subtle improvements quietly executed behind the scenes. The result of all this tinkering is a blend and accessibility that no other Howard publication can match. For those who value rare Howard stories, poems, and fragments, the latest ish contains REH’s “A Touch of Color,” published previously only in the nearly impossible-to-find chapbook Pay Day. Canadian Charles Saunders, one of fantasy’s primordial black talents, brings his vast store of knowledge on African history to bear on Howard’s Hyborian Age. Danny Street tells you everything you’d want to know about Howard’s conception of the alluring, poisonous flower known as the Lotus. Morgan Holmes reviews a new Conan comic, and Cimmerian stalwarts Leon Nielsen and [redacted] fill out the issue with even more articles. 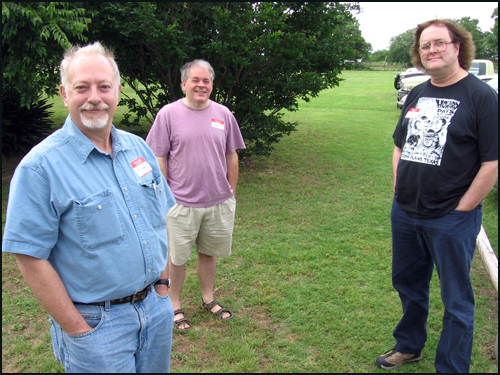 The artists include recent Cimmerian Award winner and REHupa Official Editor Bill Cavalier. Whether you are a comic-book loving, RPG-playing fan, or an academic intent on studying Howard as a classic American writer, there is something for you in REH: Two-Gun Raconteur #11. There’s been a lot of bagging on the publications put out by the Robert E. Howard Foundation of late, but it looks as if things are turning around. This latest book, which was handed out to subscribers of the series at Howard Days, suffers from none of the deficiencies of A Rhyme of Salem Town and Other Poems. Well, I still blanch at the cover — comic book imagery, no matter how skilled, subliminally infantilizes the thoughts within, whereas a sepia-toned photograph would have lent an aura of Golden Age class and distinction to those same thoughts. But the book itself is meaty, well-formatted, and filled to the brim with previously unpublished REH. If you are the proud owner of the two-volumes of Necronomicon Press’ Selected Letters of REH, you frankly will be astounded by all of the new material on display here. 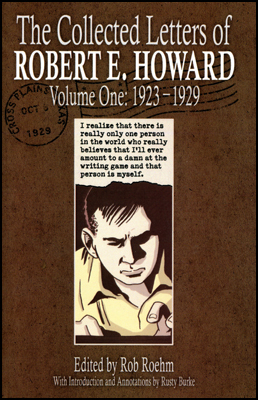 The claim made by Robert M. Price in the Introduction to Volume 2 of Necro’s Selected Letters — that, unlike Lovecraft, Howard fails to reveal his true personality in his correspondence — is destroyed once and for all in a flurry of new revelations and insights into the mind of the Father of Sword-and-Sorcery. And to think that this treasure chest of riches in only the first of three set to appear this year. It’s an achievement. My guess is that by the time this project is finished, REH’s three volumes of correspondence will have opened up as many doors to further study as Lovecraft’s five-volume series did back in the day. The publication of such a project, and the intrinsic fascination of the letters within, is a massive confirmation of Howard’s value and interest as an author worthy of, and capable of absorbing and rewarding, serious study. This is the kind of thing that tends to shake loose all kinds of scholarship that would otherwise never have been written. It’s a galvanizing force in the field, and I predict that old and new Howard fans alike will find much within these books that will spur them on to new explorations of the Texan’s fiction. The mental picture we have of Howard is about to become much richer and more complex, exactly as Lovecraft’s did when his own letters were published. Howard’s was a serious, thoughtful, brilliant mind, and learning about how his personal life and experiences crept into (and often overwhelmed) his fiction can only improve one’s evaluation of his artistry. The snide criticisms and flippant dismissals of yesteryear keep looking sillier and sillier in the face of such books.